For many people, the idea of a bus or plane journey with toddlers can be unnerving. Have you experienced the fear of tiredness, boredom and sickness setting in and causing disruption to other passengers? Don’t fret, travelling with young kiddies doesn’t have to be a daunting task. With a little planning, preparation and careful packing you can ensure a hassle-free trip with your little ones. We’ve compiled a list of useful tips to help you on your way to stress-free family holiday. 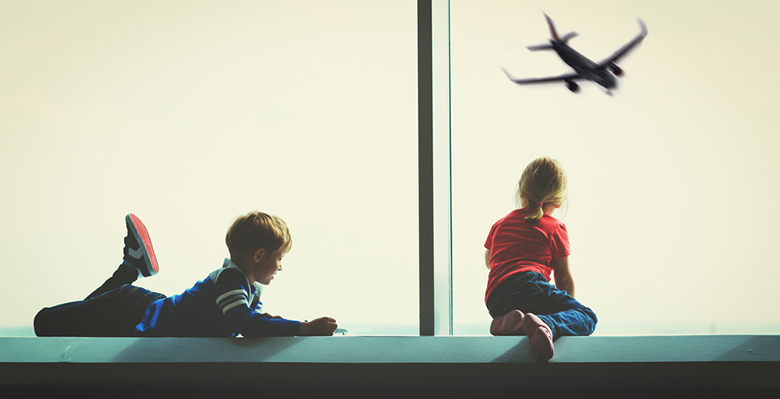 Flying can be an unusual experience for children, from the confined space to the strange noises. To help with the change in pressure, stock up on some sweets, a lollipop or drink to give them when taking off and landing. The sensation of popping ears can be scary and often leads to disgruntled, teary kids. Although a must-have at all times, baby wipes become a parents most-valuable resource when travelling. When a mess occurs on the go, limited facilities can make the clean-up operation tricky. Baby wipes are a life saver when it comes to a speedy nappy change, messy eating and everything else in between! When kids are around, mess is inevitable. Make sure to pack some extra clothes and nappies to deal with any accidents or spillages your little one may have. Bus and plane journeys can leave toddlers feeling confused outside of their usual surroundings. To help them sleep, don’t forget to pack whatever soother helps them settle. Comforters might include their favourite toy, blanket, teddy or dummy. Space permitting, it might be worth bringing a travel pillow to help them drop off. Okay, so you might be hesitant to hand a phone or iPad to your toddler to keep them entertained, but kids love doing what ‘grown ups’ do. There’s lots of child friendly apps, games and cartoons available to download that will be sure to keep their attention for the duration (or even part of) the journey! Trunki aims to make the journey just as enjoyable as the destination by allowing kiddies to feel involved in the trip. Not only can they help pack their own case, they can enjoy riding it through the airport too. The novelty aspect of this design will help avoid boredom and temper tantrums as you travel through a busy airport! It can be challenging to get your children to sit still at the best of times, never mind on a bus or plane full of strangers. While you can’t guarantee your little one will be on their best behaviour on board, a little preparation can go a long way. With some careful planning, you can help distract them from boredom to make the travel experience a pleasant one for the whole family.